Next to my grandparents’ telephone was a little silver can of little sharp pencils. Very little pencils. As would be a full-sized pencil, now used up and sharpened, all the way down to the eraser. Every part of that pencil used except for the very end…sharpened and ready to begin…just before the end. My grandfather lived during the depression. For him as for many, to cast away anything so precious as a pencil stub was to waste money on another pencil — that could have been used for an apple, a sandwich….a coffee…or flour to make bread for a family. To cast away a pencil was folly. To dispose of a pencil was to waste a resource. My grandfather came to this country at the age of fourteen. He was sent here by his mother, all by himself, alone…to begin a life. I cannot forget those pencils. keep going and don’t quit — stay sharp until the end. 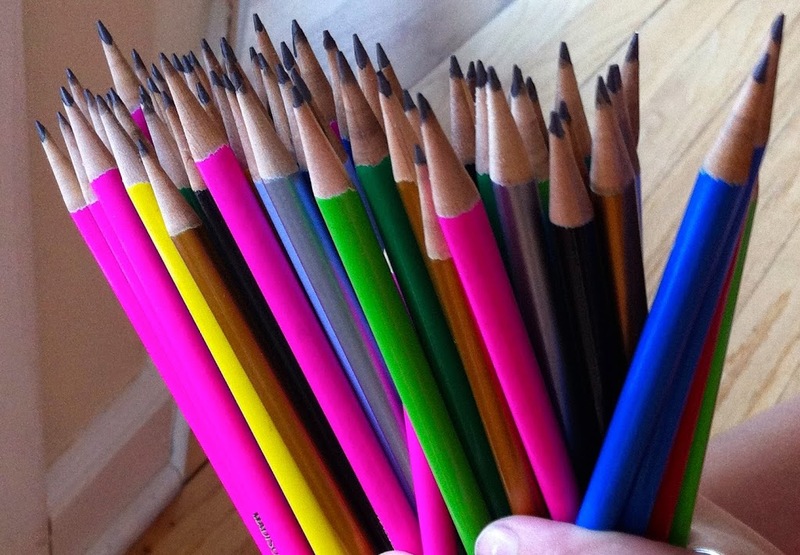 Now, for me, it is pencils that are wearing me down. As part of one-of-those-things-that-parents-have-to-do-these-days, I have had to take on a volunteer job. After almost twenty years doing PTA and the like, I really, at this point (yes, pun intended) I want to do the minimum. But alas, I was required to take a job. Instead of being a concert parent or a trip chaperone or shlepping snacks I decided that I would be the parent who would sharpen pencils. How hard could that be? — I thought. I sent a note to the director of this program, saying — hey, everyone has to be good at something in life. I might actually be good at sharpening pencils. And truly — I thought — how could anyone be bad at this? Further, I thought that the job would take an hour or two and I would have fulfilled my commitment for the year. Wrong. Again, I judged prematurely. I seem to do this a lot. I went to collect the pencils and was handed an electric pencil-sharpener (“trust us, you will need this, Leslie”) and 576 pencils. FIVE HUNDRED AND SEVENTY-SIX PENCILS. Now I am home, sitting at the kitchen table, sharpening pencils. After every fifty or so, the sharpener overheats and just stops working, at which point I am sharpening by hand. The electric sharpener takes at least an hour to cool off before it works again. So I take a break to make lunch. Cook dinner. Walk the dog. Read something, talk to someone, clean something. So now one, two, three hours of work — I have maybe done sixty or seventy…now it’s five hours, six hours — eleven o’clock at night I am sneaking into the kitchen to do another fifty-seven pencils before bed. I dream that night that I am drowning in pencils. I dream that I am lying on a bed of nails — er, pencils. And oh, they have been freshly sharpened. Ouch. Somehow it seems that I have chosen the most difficult job. Yet I can’t quit — I have to carry on. Four days later I deliver four-hundred-something pencils. Still almost two hundred sitting my table. Keep Calm and Sharpen On. But then my world overheats. It breaks down. that made everything easy no longer works. Things are not going the way they should. Not only do I have to sharpen those pencils but now, in order to continue, I have to find a way to sharpen myself. And you know, that is the most painful part. Sharpening myself means honing the part of me that has felt most useful — that part of me that everyone sees — so that me, as my pencil self — can be sharper and clearer in the world. It is painful, in fact, to be sharpened. All those wood shavings, all those parts of me — always get everywhere. To write with a newly sharpened pencil there is precision, there is clarity. After awhile it becomes worn down and needs to be taken to tool. After awhile I become worn down and also need to be taken to tool. For myself as well, newly sharpened and fresh and hopeful looks quite a bit different than worn down and waiting for renewal. Our mother takes us to the border and sends us to America because we need to begin again. Just like my grandfather did. It becomes a never-ending cycle, it seems. Live our lives, wear down, sharpen. Use the lead to write simple arithmetic. Wear down the point writing the quadratic equation. Wear it down writing a story. Wear it down writing your story. Draw a tree. Draw a house. Design a house. If you don’t like what you have written, if you make errors in your math….you can always erase. But you always have to keep sharpening. Read something. Talk to someone. Keep sharpening until you are down to the stub. Keep sharpening until you are down to the eraser. Stay sharp until the end. Remember that in a little cup next to the telephone — or on the kitchen table — there are five hundred and seventy-six reminders to stop volunteering for stuff. There are five hundred and seventy-six reminders of renewal.